Lee Johnston has signed for Jackson Racing for the 2017 international road races. Lee Johnston is aiming to lay his 2016 demons to rest after signing for Jackson Racing to ride Honda machinery this year at the international road races. The Fermanagh rider had a torrid time after his father Everitt sadly passed away following a brave cancer battle last year, while Johnston also suffered on the racing front, with a crash at the Scarborough Spring Cup meeting in April scuppering his North West 200 and Isle of Man TT hopes. 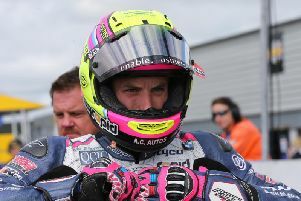 A practice spill at the Ulster Grand Prix in August left Johnston with a broken collarbone and ruled him out for the remainder of the season. The 27-year-old then became a free agent in September following East Coast Racing’s decision to withdraw from the sport, but Johnston has now finalised his plans and is looking ahead to the 2017 campaign with renewed enthusiasm after signing for the Preston-based outfit. The ‘General’ will ride Nicky Hayden’s 2016 Ten Kate Honda World Superbike-spec Fireblade and will also have a 600cc Supersport machine, plus an all-new 2017 Honda Fireblade SP2 for the Superstock class. “I am genuinely really happy and I can’t wait to get on the bikes and start testing,” Johnston told the News Letter. “It’s been a while since I rode a Honda and the last time I did was actually at Macau a few years ago, so I’ve good memories of the Honda, and also with the Supersport bike. Hopefully we can kick on and get some wins on the board. “The way it’s looking at the minute is that we are going to run the new Honda Fireblade Superstock bike and last year’s Ten Kate Superbike. It will give us a bit more time to test because the new Superstock bike probably won’t be here until the end of March or else the start of April. The 600 is already being built so at least we can test both bikes and then focus more on the ’Stocker when it arrives,” he added. Johnston showed what he is capable of with a magnificent run of form in 2015 that saw him win the Superstock race at the North West 200 and bag a treble at the Ulster Grand Prix with a man of the meeting performance. He also finished third in the Superstock TT behind Ian Hutchinson and Michael Dunlop during a memorable year and is fired up to return to the same level this year. “I’ll be trying my hardest and I want to get back to where I was in 2015. I feel better in my life now than I have done for a while, with my dad and stuff last year and the injuries,” he said. Johnston will also compete at the Macau Grand Prix in November in addition to the North West, TT and Ulster GP. He is set to begin testing in Spain in March and plans to contest a few rounds of the British Supersport Championship prior to the North West. Johnston has also been offered the option of competing in some rounds of the Dutch championship by Ten Kate. The Jackson Racing team is headed by former Manx GP outright lap record holder Alan Jackson Jnr.